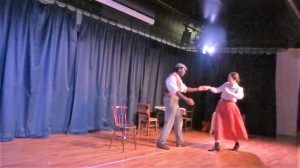 The six performances of After The Storm were the culmination and resolution of the larger heritage project Back From The Western Front, staged to coincide with Black History Month and the Centenary of The Great War. 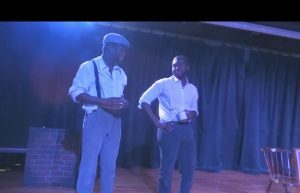 Madu and Kofi discuss the workers unions and their own lack of representation. Madu dances with his new found friend, celebrating the African troop’s inclusion in the victory parade in the final scene. The cast thank the director and technician following the performance. Police visit Madu’s home to arrest him following his rally for justice. 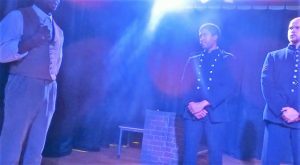 After The Storm is a 1hr 15min touring performance bringing to life the story of Okoli Madu, an African returnee soldier struggling to resettle in London in 1918. Following job and housing shortages in London in the year following the end of the Great War, the production highlights the negative impact this had on servicemen from all over the commonwealth, particularly in relation to blatant racism- on both personal and institutional levels. This included the violence and riots that ensued on the streets of London and inherent daily prejudices, based purely on colour. 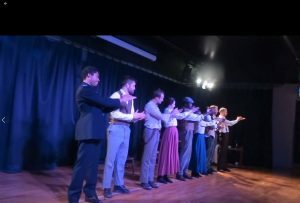 Inequalities recognised as ‘never an issue during the war’ and the injustice of this, ‘We fought side by side’ becomes an undeniably prevalent theme for the audience to reflect upon. In parallel narratives, the generosity and warmth of members of London communities are explored and friendships flourish. Recognising their responsibilities, governing forces begin to intervene. Step by step progress is made and justice begins to prevail. It is clear the journey ahead will be long and arduous, but ultimately the message is one of hope and unity, ‘we are one and the same’. 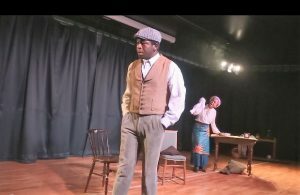 The story is based on historically accurate events, including the murder of Kofi, a decorated African serviceman, drowned in the docks during a particularly violent riot. Additional fictionalised characters tell the human stories and bring the history and heritage of this time to life. A total of 87 audience members attended the performances. 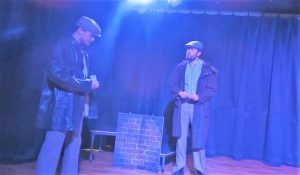 “A very entertaining play which although painful to watch at times, was full of hope and positivity. It taught me a lot and makes me grateful to these pioneering people.”– J. Jackson-Callen.